Ya’ll, I usually don’t wear things too splashy or loose, but Honey bought this watercolor crepe blouse for me back in May for Mother’s Day. I don’t like to wear too much extra fabric, but this seems like just enough. He has NEVER read my blog and has cotton in his ears when I talk about it, LOL. But, he must have been paying attention to some of the things I have been wearing. Although, he prefers that I not show my “body outline” too much. Well, as long as I have some type of figure left, I will “show it” with discretion, for the sake of style and my Flair Seekers who need inspiration, right ladies? 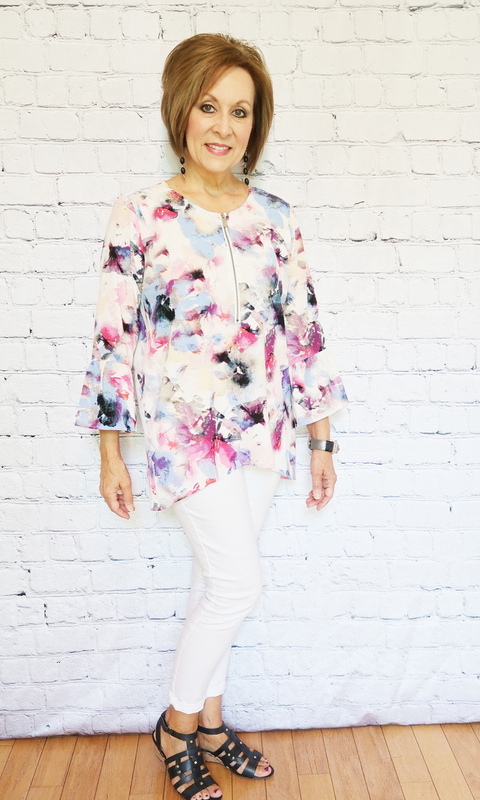 The lightweight crepe material gives the blouse movement and the muted edges of the watercolor print keep it from being too bold and overwhelming, soft and flattering for most. The colors are middle range jewel tones with some softer pinks and blues tossed in there that work for most skin tones. 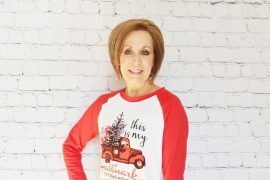 This style of blouse has nice lines and is flattering for most body types. I like the longer hem in the back, the bell sleeves, and the exposed zipper in front which makes a necklace optional. Believe it or not, I see Fall things already appearing in the stores! 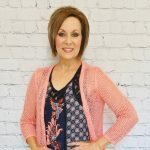 July is still very hot and humid here in Georgia and we will stay in the 90s up to 100 through September, so warmer clothing will take a while to wear. 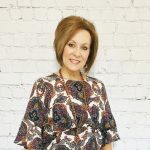 This blouse is actually a nice way to enter early Fall without being too hot or the watercolor print looking off-season. The white jeans keep it summery, but black or navy jeans or dress pants would take it into Fall with no problem. I have chosen black as the accent color from the watercolor print since there is a lot of white going on in the background and my Old Navy jeans are white. These are the sweet “blessed” drop earrings that I was given from the “Broken Bull” boutique on our trip to Blue Ridge. You can read about that shop and why I call the earrings “blessed”, and also about our trip to Blue Ridge in my previous post here. I love my cuff bracelet that has interchangeable snap-on centerpieces. I do have a wholesaler from which to purchase these and will offer them soon. I keep saying that, I just need to get an order together and it will be all set. My black gladiator wedge sandals are older and by Naturalizer. I found a similar option for you by Aerosoles here at Amazon. There are numerous colors and tones in this watercolor fabric to choose from for accent jewelry and shoes. The blouse is the “Chaus” brand, Honey bought it from Steinmart. I found the “Chaus” brand in the same fabric but a different style here on Amazon. It does have shorter flutter sleeves, but it is the same fabric. Here is a bell sleeve version in a different, deeper fabric that would also be nice for Fall. Stay tuned for this Thursday where I will style the second blouse from Honey. He may just become my fashion stylist, don’t dare tell him that, ha! LOL. Did you enjoy this post: Why Watercolor Prints Work for Everyone? Pin It! Your Honey has good taste Lori Jo. I love the muted colours. Like you, I’m more of a ‘fitted’ person and don’t wear too many loose flowing tops. This one looks elegant and I could definitely see myself wearing it. Thanks, Sue! I do like this top, but have to be in the mood for “flowy”. This is not normally something I would not buy for myself, I am also usually big about solids with fun accessories, and that seems to suit my size and height best. Hubby did okay though, but I do have to be in the mood to wear it. Thanks for visiting! 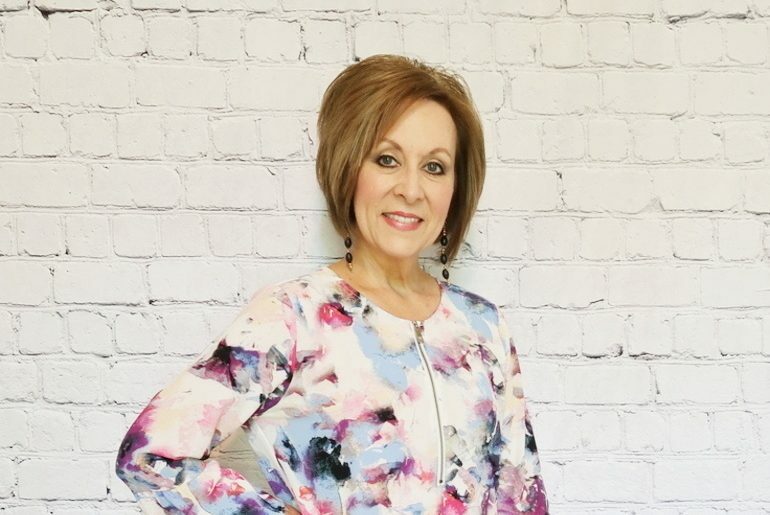 I don’t believe I own anything with the watercolour print, I love love floral prints….. Guess I have just never came across anything in the watercolour that has caught my attention enough to buy…lol…..ill keep this short as I am helping my Mom get ready for a yard sale on Saturday, and I am also going through clothes, purses and shoes trying to decide which ones must go…lol….it’s time! 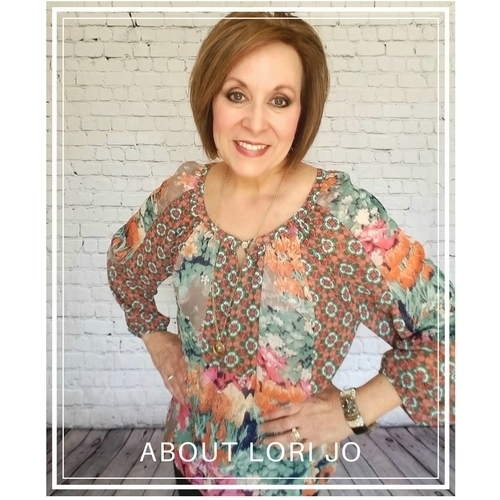 Have a great day Lori Jo! Hey, Kathy! It is fun to try new things, I didn’t think I would like this, it is kind of on my “B” list for when I want to go loose and flowy. Enjoy that yard sale, I hope it is a success. Talk soon!